Ties assorted Polyester. Designs and Assorted Colours. Minimum order of 60 units : 1,80 eur. From 120 units : 1,50 eur. Shengzhou Creditable Friends Imp&exp Co., Ltd.
Short on time? 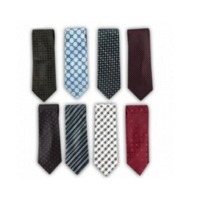 Let neckties sellers contact you. Ningbo Yinzhou Yuanchi Fashion Co., Ltd.
Neckties Customers can order and select the designs from us. If they buy more than 200 pcs we can give them a discount. We can custom made for customers and they can either give their designs for us or we design for them. Minimum quantity for custom made is 1000 pcs. Neckties can either pack in metal tins or in boxes. Cufflinks can either pack in a boxes or pack in a transucent bag. Customers have to pay for the packing material like metal tins, boxes and transucent bags. Necktie Neckwear Neckties, bowties, scarves, handkerchiefs: The fabric of our silk necktie, silk bowtie, handkerchiefs and silk scarf is crepe de chine, satin, twill, georgette and so on in printing, woven or yarn dyed. Since there are many designs and specifications , you can also offer us your design, samples and we can Manufacture as per your requirements. Necktie Various pattern are available : Plain, classic, stripes, sports, X'mas, cartoon, checkers, animals, fun Material used : Silk or polyester in woven or printed. Necktie 100% silk. Three fold. Golden with silver/black striped zebras. Necktie, blue/grey-blue stripes with white, blue & navy-blue flowers. 100% light silk.